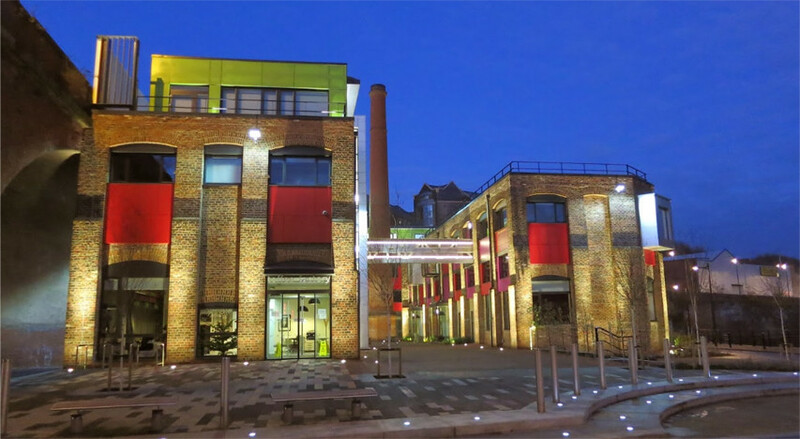 If you have time, a walk from the station to our office is certainly worth the effort as you will be rewarded with some spectacular views of the historic Castle Keep and the Quayside all the way to the Toffee Factory. From the station turn right along Neville Street and continue down ‘Westgate Road’ until you see the Castle Keep. Either walk through the Keep or down ‘The Side’ until you reach the Quayside then simply turn left and walk along the river until you reach the Ouseburn…we are through the brick arch opposite The Tyne pub. The QuayLink bus route runs from the central train station to the Toffee Factory via the City Centre and the Quayside. Pick up the Q1 bus at the train station and change at ‘Quayside’ to take the Q2 bus to either ‘Lime Street’ or ‘Balast Hills’. Both these stops are within a couple of minutes walk to our office. If a walk isn’t convenient, there are plenty of taxis on hand from the central train station. Ask the driver to take you to the Quayside entrance and in the unlikely event they aren’t familiar with the Toffee Factory, simply mention The Tyne pub on the Quayside. Newcastle International Airport is well serviced with both domestic internal and international flights. Whether by taxi or the City’s Metro rail network, we are only a short journey away. Use SatNav postcode NE6 1BU. Follow the route on the map above to lead you from City Road / A186, down Horatio Street (opposite Hotel Du Vin) and along the Quayside. Drive past the Toffee Factory signposted on the left (through the brick arch of the bridge) and turn right into the free Spillars Car Park which is immediately past the Ouseburn Regeneration Centre (home to the ‘Cycle Hub’). If you are in any doubt then give us a call direct on +44 (0)191 375 9130 and our receptionsist will be able to help or put you through directly to a member of our team that you may wish to speak to.